Notes: 1883 - 1917. 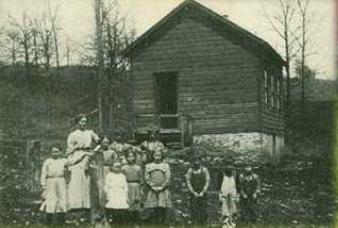 This was the last school built in the township. School District No. 7 was formed on October 30, 1883 and a school was constructed soon thereafter. 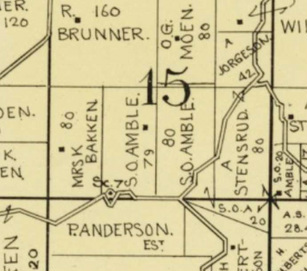 Ole S. Amble and John Wall leased about 3/4 of an acre to the school district for five cents a year as long as the land was used for public school purposes. On April 12, 1916 the school voted to build a new school (Sandridge 2) adjacent to the old one under the same lease terms. 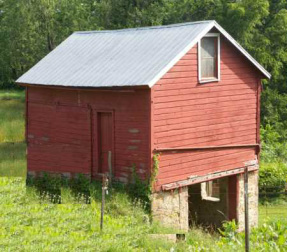 On May 22, 1917 the old school was sold and moved to the nearby Sever Amble farm where it still stands in 2014 having been used a granary and horse stable over the years.